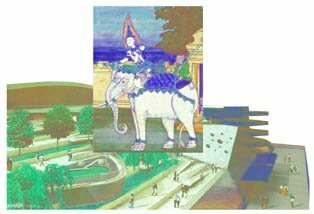 Friends for Our Riverfront: Beale Street Landing - a white elephant already ? ! Beale Street Landing - a white elephant already ? ! If you drive along Riverside Drive, you’ll see that work has started on Beale Street Lanindg (BSL). But the project is far from finished, and much more tax money is slated to be spent in the future. Meanwhile, Majestic America Line, the company that wanted to use the new boat dock, is in financial trouble, trying to sell their boats, and plans no trips for 2009 or any time in the future. Looks like BSL could already be a white elephant. Here's the Flyer article that broke the story and other information on the $29.4M public project. Click here to read the Flyer article. Click here to read Majestic America’s announcement. Overview of project - What, Where, Why, Who? Do we need it? Can we afford it? Could this be the real reason for the landing?